On Saturday, June 3 (9 AM to 3 PM), the City of Kent is hosting its annual summer Recycling Collection event at Kent Phoenix Academy (11000 SE 264th St., Kent, WA). 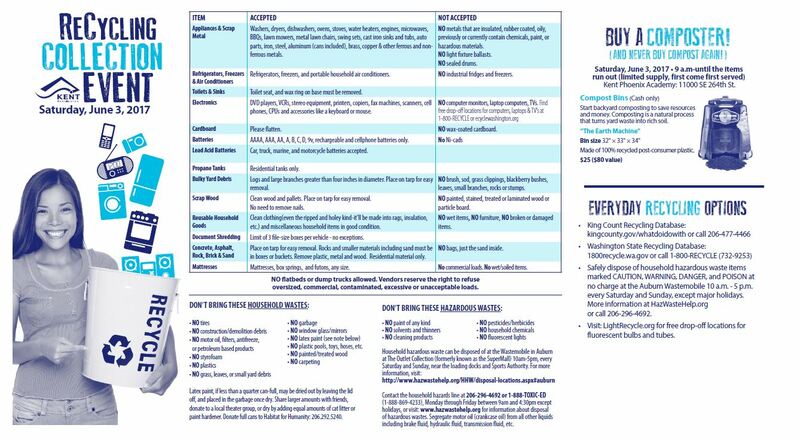 See the city’s flyer for additional restrictions and other recycling options. In addition to recycling, the city will be selling compost bins for $25 each (cash only, first come, first served) for backyard composting. Supplies are limited.